Store your roll away bed in a handsome looking box. We can make the cabinet in any of the finishes indicated below. The box can be made to any size. Choice of handles are available. This Bed is a good accent piece for any room. 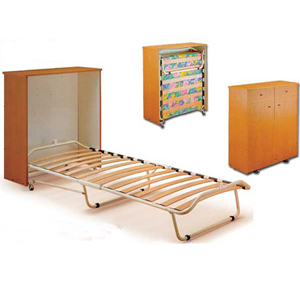 It can be made for any one of our beds or your own bed. The bed is available in 30 In., 39 In. and 48 In. Size. Finish Shown is Beech. As shown: Folding bed Size is 31 In. x 75 In.. The cabinet size is 34 In. (W) x 40 In. (H) x 14 In. This item if for the Box Only. We can make it to fit any one of our beds.